Volunteer project: Jinan is around 200 km away from Seoul and is famous with its beautiful scenery, the provincial park and the Mai mountain which looks like horse's ears. The residents of Jinan are concerned about the depopulation of the area, and especially about the decreasing numbers of teenagers and young people in their 20s. The volunteers will join a Youth camp which aims to develop the global competencies of local young people by bringing a dynamic international cultural program. Participants will run activities related to their own cultures such as languages, traditional dance and games, songs, etc. The team will also help to decorate a local school with a mural painting and will support elderly residents with farming. In addition, there will be cultural exchange activities with local youth. Volunteer project: The Baekje is one of the ancient kingdoms in Korean history. The kingdom was located in the mountainous mid-western region of the Korean peninsula and lasted about 700 years from 18 B.C. to 660 A.D. The Baekje Historic Area has eight archaeological sites dating from 475-660 A.D. including the Gongsanseong fortress and royal tombs at Songsan-ri related to the Ungjin capital Gongju; the archaeological site in Gwanbuk-ri and Busosanseong fortress, Jeongnimsa temple site, royal tombs in Neungsan-ri and Naseong city wall related to the Sabi capital Buyeo; the archaeological site in Wanggung-ri and the Mireuksa temple site in Iksan related to the secondary Sabi capital. In July 2015, Baekje Historic Areas became a World Heritage site. UNESCO World Heritage Committee adopted a statement of the Outstanding Universal Value of Baekje Historic Areas because of its contribution to the cultural development in ancient East Asia. The aim of this project is promoting the importance and value of the Baekje Historic Areas among local people and volunteers from all over the world, and raising the public awareness about the site. Participants will organize a global culture camp for youth not only to raise their awareness of the world heritage site but also to give them a chance to experience the cultures of other countries. In addition, they will learn more about the importance of the world heritage and also how other countries treat the world heritage. Volunteer project: Goyang is located only one hour away from Seoul. It is very famous since contemporary culture and nature live in harmony in the city. There are a lot of natural attractions in Goyang such as the Janghang Swamp, Haengjusanseong, Korean Cultural Mountain Fortress. Goyang city received even more attention since places related to Hallyu (The Korean Wave) are located in this area, such as MBC Dream Center, Korean TV Broadcasting Center and K-pop Experience Center. In 2006, Janghang Swamp was designated as a wetland protection zone under the Korean Wetlands Protection Act by the Ministry of Environment. Due to controls on public access, its high biodiversity and ecosystem are well-preserved. The aim of this international volunteer project is not only to recognize the ecosystem but also to organize a Global Youth Camp. Participants will organize activities and campaigns for the preservation of the Janghang Swamp together with local students. Volunteer project: Gongju is about 150 km away from Seoul, located in the center of South Chungcheong province. Gongju is an ancient city of the Baekje Kingdom, where the brilliant Baekje culture flourished. Nowadays, Gongju is a city of history, culture and tourism. As the population of the region is aging and rapidly decreasing, local organisations are focusing on the young people who are isolated from high education opportunities. Every year, a summer school is organised for local youth in order to teach them the value of local culture, history and nature. The international volunteers will join in the summer camp as assistants and will create new dynamics in the program by introducing international cultures. 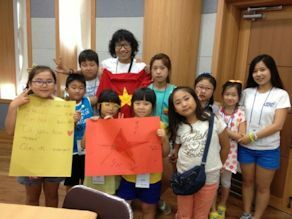 The volunteers will organise and take part in the various activities of the summer school such as sports days, role play, intercultural food days, with about 40 young Koreans. The programs in the summer school are focusing on local community, cultural exchange, eco-friendly activities. Participants should be active as assistants, ready to mingle with the youth and also need to introduce different aspects of their own culture such as food, dance and songs. You will learn how to run a youth project and how to work in a large team. Special requirements: Active participation in outdoor activities and strong interest to work with youth are expected. Leisure activities: Visiting the historic places of Gongju. Accommodation: In rooms in the education center in Gongju. Volunteer project: Yeongwol is the most nature-oriented and clean city in South Korea. It is about 200 km east of Seoul. The area is surrounded by mountains and a river. Local young people rarely have the opportunity to experience different cultures from abroad. This project is held in cooperation with the local Children’s care center. The project site is well equipped for the activities. There are two main activities during the project. First, the volunteers will become teachers to a group of around 30 local youth and will introduce their traditional culture to the students. They will take part in various intercultural activities. Any kind of activities and ideas from participants are very welcome such as traditional cultures, sports, games, choir, drawing, educational workshop, etc. Second, volunteers will have some community service activities, helping the locals with manual tasks such as weeding, potato picking, etc. Location: Yeongwol, Gangwon province. Yeongwol is easily accessible from Seoul by express bus for about 2 hours. Volunteer project: Busan is the second biggest city and the largest port in Korea, and it's about 400km south of Seoul. The volunteer project is organized in cooperation with a young artists network in Busan. They are specialized in installation art and are interested in reviving the city through public art such as painting, making posters and boards, benches, etc. The works will be exhibited during the local Art Festival. The project site is quite unique due to its location. It’s a small village in the very modern city, but located in the mountain, so it has fresh air and nice natural landscapes. Several events are planned to promote performance art and public art. Artists from different countries are invited to take part in these events. The volunteers will assist the artists to assemble, prepare and display their art pieces. The artists are excited to work with international volunteers. Special requirements: Interest in art. Volunteers should be highly motivated and ready for physically demanding tasks. Volunteer project: Jecheon is about 200 km away from Seoul and is famous with the beautiful mountains around. There are some social issues in the city regarding the care for disabled people and dealing with the aging population. The international volunteers will take part in a voluntary service project in support of local residents. Participants will help physically and economically disadvantaged local elders by improving their living conditions. In addition, there will be cultural exchange events with the local people. The group will do voluntary service for the local community. The volunteers will make a mural painting to decorate a local village, will renovate and maintain houses and public facilities for disadvantaged elderly, will help with farming activities. Special requirements: Volunteers are expected to have an interest in working and interacting with the local community. 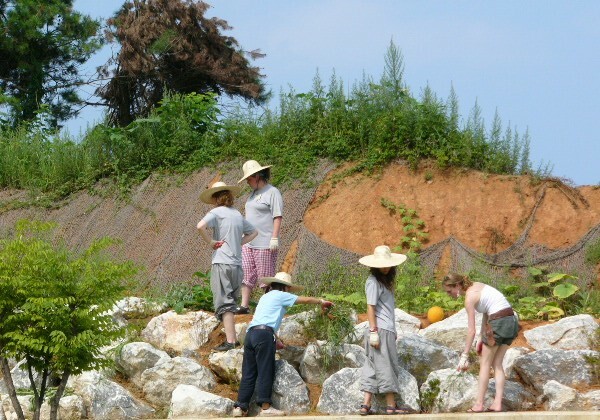 Volunteer project: Miryang, often spelled Milyang, is a city in Gyeongsangnam-do Province. Miryang is known around Korea for the Miryang Arirang and for the view from the Yeongnammu pavilion. Because of its high prominence as a tourist destination, many people visit Miryang all year round. However, there's a big difference in the development of Upper Miryang and Lower Miryang, and the city is facing serious imbalances in terms of development and economy despite the big number of tourists visiting. A regeneration and support program was initiated with different activities aiming to improve the living conditions for residents but also to preserve the natural environment. Volunteers will join locals in their efforts to renovate and improve the city. Participants will renovate old houses and will help residents to paint walls and facades. They will also work on environmental tasks and will join cultural exchange activities with the local people. Special requirements: Volunteers are expected to have interest in manual work and some knowledge in city regeneration. Volunteer project: Yeongwol is the most nature-oriented and clean city in South Korea. It is about 200 km east of Seoul. The area is surrounded by mountains and a river. Local young people rarely have the opportunity to experience different cultures from abroad. This project is organised in cooperation with the Youth center in Yeongwol. The volunteers will organise a summer camp program for a group of children. The sessions in the program are quite open; there will be various and exciting activities in the river, mountains and playgrounds. The project site has different equipment and facilities for outdoor and indoor activities such as music instruments and sports equipment, so any ideas for the camp are welcome. If you enjoy interacting with youth, working outside, swimming, you will have a fascinating time with many valuable experiences on this project. Special requirements: Interest in outdoor activities and sharing your culture. Leisure activities: Visiting historic places and exploring caves around the area.